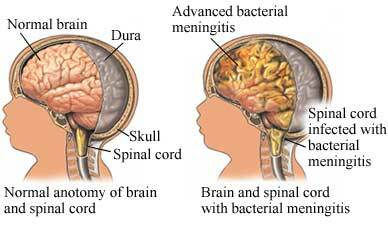 Meningitis is bacterial that causes inflammation in the brains and spinal cord membranes meninges. This can be severe because of the complications that can usually accompany this type of meningitis. Swelling from meningitis can trigger symptoms such as a fever, headache and stiff neck. The majority of the Meningitis cases in the U.S are caused by viral infection. Bacteral and fungal infections cause the rest fo the meningitis cases. In some of these cases, treatment is not required, and people start to show improvement within weeks. In others cases, meningitis can be life-threatening and will require emergency antibiotic treatment. 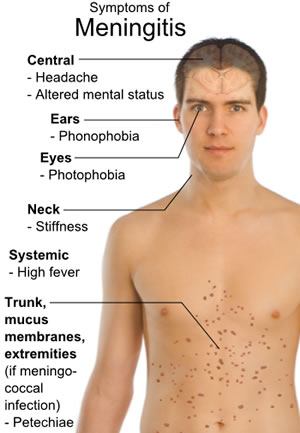 Early symptoms of meningitis may seem more like the flu (influenza). It may take several hours or a few days to develop these symptoms. Bacterial meningitis is a very serious and can be fatal within days if prompt antibiotic treatment is not a administered. Delaying treatment increases the risk of permanent brain as well as death. 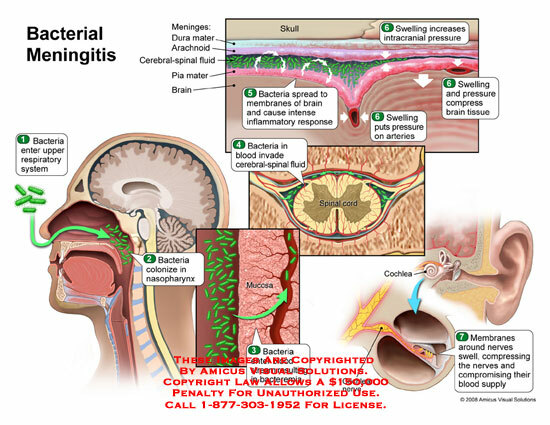 Bacterial Meningitis occurs when bacteria that enters the bloodstream and reaches the brain and spinal cord causing acute bacterial meningitis. This can also occur from bacteria invading the meninges, caused by an ear or sinus infections, a skull fracture or in rare cases after surgery. There are several different strains of bacteria that can cause acute m meningitis. Streptococcus pneumonia (pneumococcus)- This bacterium is the most common cause of bacterial meningitis, adults, young children and infants. It causes pneumonia, ear infections or sinus infractions most commonly. Taking a vaccine will help prevent this infection. Neissera meningitides(meningococcus) bacterium is the second leading cause of bacterial meningitis. This bacteria commonly cause infeactioons within the upper respiratory system. However, can also cause meningococcal meningitis that enters the bloodstream. This infection is highly contagious and affects mainly teenagers at school and young adults in colleges, dormitories, boarding schools and military bases. A vaccine can be taken to prevent infection. Haemophilus influenza (Haemophilus) type B (Hib bacterium use to be one of the leading causes of bacterial meningitis in children. There are new Hib vaccines that significantly reduced the number of cases in the type of meningitis. Listeria Monocytognese (listeria) These type of bacteria can be found in hot dogs, luncheon meats, and unpasteurized cheese. Older adults, people with a weakened immune system, pregnant women, and newborns are most at risk to get listeria. Listera can cross the placental barrier in pregnant women, causing infection in late pregnancy, leading to death for the baby. Skipping vaccinations Risk increase for anyone who has not completed the recommended childhood or adult vaccination schedule. Age Most cases of bacterial meningitis occur in people under the age of 20. Viral meningitis is most common in children younger than 5. Women who are pregnant have increased the risk for listeriosis. Infections caused by listeria bacteria increase the risk of miscarriage, stillbirth, and premature delivery. People with compromised immune systems, People with AIDS/HIV alcoholism, diabetes, or use immunosuppressant drugs, and other factors that affect their immune system will make them a higher risk of getting meningitis. Having your spleen also removed will increase the risk. People without spleens need to be vaccinated to reduced the risk. Complications for meningitis can be severe. The longer a person has the disease with treatment the greater the risk of serious and permanent neurological damage. Prompt treatment will lead to an early recovery in most cases. A family doctor or pediatrician can diagnose meningitis based on the medical history. A physical exam and particular diagnosis test. During the exam, you doctor will check signs of an infection in different parts of the body, including head throats, ears and the skin on the back along the spine. Blood Samples are placed in a special dish to see if microorganisms, particular bacteria will grow. A sample is placed on a slide and stained (Gram’s stain) then it is analyzed under a microscope for meningitis backer. Imaging from Computerized tomography (CT) of magnetic resonance (MR) scans the head of inflammation and swelling. X-rays or CT scan of the sinuses and chest may show infection areas that are linked to meningitis. Acute bacterial meningitis needs to be treated promptly with intravenous antibiotics and now, corticosteroids. This ensures rehabilitation and reduces the risk of complications, such as brain swelling and seizures. The blend of antibiotics depends on the type of bacteria that is causing the infection. Your doctor may prescribe a broad-spectrum antibiotic until he or she can determine the exact cause of meningitis. Your doctor may also drain any infected sinuses or mastoids — the bones behind the outer ear that connect to the middle ear.